Gypsy interrupts a warehouse robbery - or so it seems. When Captain Atom, Supergirl, Atom Smasher, The Ray, Black Lightning, Huntress, The Flash, and the Atom arrive to help they are shocked to discover the thieves actually OWN the property! Well Gypsy was just starting to feel like part of the family and is harshly slapped down for not checking facts and acting like a rookie. The League were apparently in the midst of preparing security for the Global Defence Summit when Gypsy had called them away. 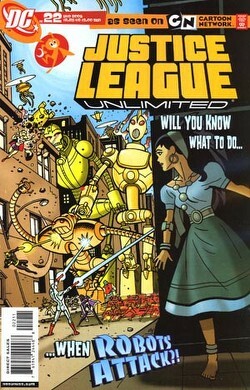 Gypsy is devastated, but something doesn't seem right about the soldiers breaking into their own property and so she immediately checks out the owners of the warehouse on the JLU satellite computers. Shockingly she discovers that a lot of shell companies had links to the owners and they all owned worthless property in derelict areas - even more shocking - they were all connected to Deacon Enterprises. Though no-one could prove it Deacon was suspected of financing supervillians after all - how would a villain like Toyman be able to afford his amazing machinery? Supposedly if villains were successful then Deacon would be eligible for a percentage of the loot. Flash interrupts Gypsy to offer sympathy over Captain Atom's personal attack. He notices some of Gypsy's research and notes that when he fought Mirror Master (Issue #12) one of the warehouses Mirror Master used as a base was owned by Deacon Enterprises. Striking a cord with Gypsy she goes back to the warehouse and discovers what she expected. The bases supervillians used - if they were caught and their base undiscovered all their expensive tech and weaponry was left behind! Searching through some of the gear she discovers a note detailing it is for use on IUP... the International Union Plaza!! After taking on some guards she calls Captain Atom - Naturally he snubs her warning of an attack on the Global Defence Summit. Quickly he is proven wrong and the League, the diplomats and the general populace are under attack from giant toy robots! Gypsy races from base to base trying to find one that the villains might be inside and finally in the knick of time - she does! The robots stop when Gypsy defeats the robot controllers and their power supply. Story - 5: Gypsy, a second stringer character gets the limelight here and actually proves she can be just as skilled as the 'leaders.' A nice well rounded story that basically offers Gypsy a lifeline into the big leagues. Something else it does is introduce us to Mr. Deacon a conniving, nasty piece of work with echoes of Luthor from STAS - nice! I hope he sticks around as a thorn in the Leagues side. Art - 5: When the comics based on Superman: The Animated Series began the art inside made you really want to buy comics, just for the visually stunning issues and finally its being translated here! I hope it stays like this! Cover Art - 4: Again Ty delivers a cool cover - the book is finally on a strong path!